Sun and high air temperatures warrant en route ozone measurements for model validations. A furry visitor takes a rest on the float plane. See the spotlight on our pilot, Joe Leatherman. High river flows lead to striking fronts of turquoise-colored water carrying glacial flour in many northeastern regions. Satellite and aerial images show widespread phytoplankton blooms in Whidbey Basin, Hood Canal, South Puget Sound, and West Bay of Orcas Island. Numerous large debris patches are observed in Hood Canal, Central Sound, and South Sound Inlets. After two years of colder temperatures and higher oxygen, Puget Sound waters are returning to expected or lower dissolved oxygen levels. Description Sun and high air temperatures warrant en route ozone measurements for model validations. A furry visitor takes a rest on the float plane. See the spotlight on our pilot, Joe Leatherman. High river flows lead to striking fronts of turquoise-colored water carrying glacial flour in many northeastern regions. Satellite and aerial images show widespread phytoplankton blooms in Whidbey Basin, Hood Canal, South Puget Sound, and West Bay of Orcas Island. Numerous large debris patches are observed in Hood Canal, Central Sound, and South Sound Inlets. 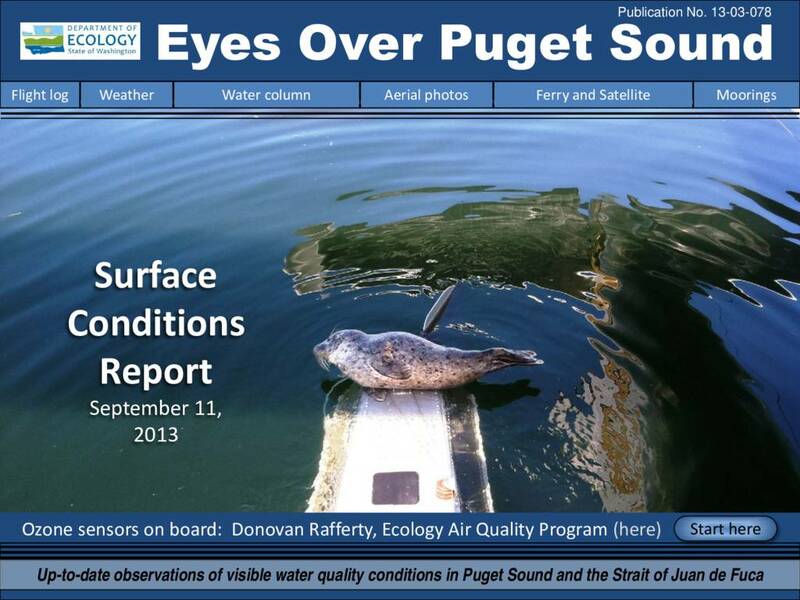 After two years of colder temperatures and higher oxygen, Puget Sound waters are returning to expected or lower dissolved oxygen levels.